Our SFR Investment Committee created a model portfolio constituting of ASX listed securities. The model is based on individual weightings over the approved list of securities and is actively managed by the committee. The individual weightings are available on our weekly in-house investment reports. 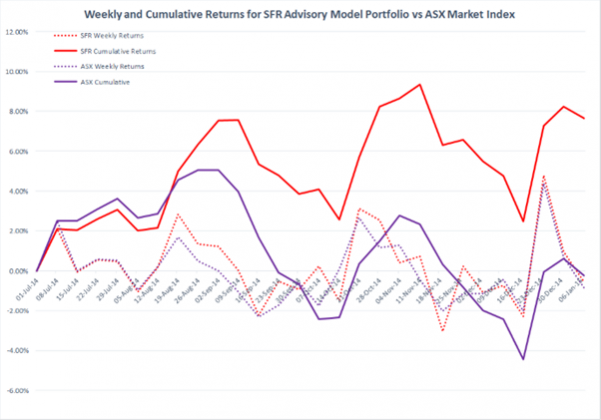 The graph below show the GICS (Global Industry Classification Standard) returns for SFR’s model portfolio against ASX sector returns. This returns are based on a rolling 12 month period to the indicated date. Email our research department, or call our office on (08) 9220 5200, if you would like a sample copy of our weekly in-house investment report. DISCLAIMER: Investing involves risk of loss. Past results are not necessarily indicative of future results. Please consult with your financial adviser before making investment decisions.